Dori Foster-Morales and Mark Eiglarsh talk about attorney mental health and how it's important to being open about your struggles as a lawyer. Part of what makes lawyer wellness so hard to achieve is the association of vulnerability with weakness. Attorneys feel they can’t ask for help or even admit they have a problem. 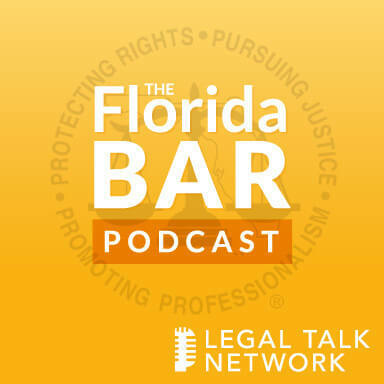 In this episode of The Florida Bar Podcast from the 2018 Annual Florida Bar Convention, host Christine Bilbrey talks to Dori Foster-Morales and Mark Eiglarsh about attorney mental health and the importance of being vulnerable and open about your struggles as a lawyer. They discuss the advantages of meditation and how the Special Committee on Mental Health and Wellness of Florida Lawyers is helping attorneys learn how to be happier and healthier. Dori Foster-Morales is a board certified marital and family lawyer and partner at Foster-Morales Sockel-Stone. Mark Eiglarsh is the owner of the Law Offices of Mark Eiglarsh and also serves as an adjunct professor at the University of Miami School of Law. Intro: Welcome to The Florida Bar Podcast, where we highlight the latest trends in law office and law practice management to help you run your law firm, brought to you by The Florida Bar’s Practice Resource Institute. You are listening to Legal Talk Network. Christine Bilbrey: Hello and welcome to The Florida Bar Podcast, brought to you by The Practice Resource Institute on Legal Talk Network. This is Christine Bilbrey, and we are recording from the 2018 Annual Florida Bar Convention in Orlando, Florida. Thank you for joining us today. I am very pleased to talk to our next two guests. We have just gotten out of an amazing session here at the Annual Convention. I have Dori Foster-Morales, who is the Chair of the Mental Health and Wellness of Florida Lawyers Special Committee, which has just become a new Standing Committee. And I have Mark Eiglarsh, who was one of our featured speakers in the CLE that we have just concluded. And I want everyone to know, if you are interested in what we are about to talk about, you will also be able to find the link on the Florida Bar website. So you can watch the whole seminar that we just concluded. So I want to start by welcoming Dori. Tell us about yourself and tell us about the work you have been doing on mental health and wellness this year. Dori Foster-Morales: So my name is Dori Foster-Morales and I am a board certified marital and family lawyer in Miami-Dade County, Florida, I have a boutique family law practice with six lawyers. I am also a member of the Board of the Governors of the Florida Bar; I have been on the Board of Governors for nine years. And this year was a very special year because I chaired the Florida Bar’s special initiative, which was a Special Committee on Mental Health and Wellness of Florida Lawyers. And what was so special about it was that there was no Committee to start with, so we were really starting fresh to try to create programming and to try to create a sense of what we needed to provide our members. And one of those things that we decided to do was to have today’s seminar, which is a series of, I would say TED style talks by seven different lawyers, with different expertises in the area of mental health and wellness and knowledge. And the thought was that everyone would speak for 15 minutes or so and provide some granules or nuggets of information for our members to think about and maybe bring back to their lives to make their lives happier and healthier. So it has been pretty terrific. Christine Bilbrey: Great. And Mark, tell us about yourself, I know you are a successful attorney, give us a little — for those that didn’t get to see the amazing video that you started with today, tell us about yourself. Mark Eiglarsh: Well, I was born and raised in Miami Beach and I actually know Dori since I was a prepubescent kid on Miami Beach. And I am married to my best friend, who I am still madly in love with, fortunately. I have three spectacular children who challenge me everyday. They always say you will love — actually they say, you will always love your kids, but will you like them? I actually like my kids a lot and I enjoy being there as much as possible. And I am right now filled with tremendous gratitude, because when Dori allowed me to share my thoughts, I was nervous, but it was a challenge for me, because not only am I benefitting because I am hearing myself say the things that I need to hear for myself, but I get a chance to share, be vulnerable and try to help people, and when I am being of service, it makes me feel good. Christine Bilbrey: Some attorneys think that this whole topic is very intimidating, it makes them uncomfortable, they don’t want to talk about mental illness or mental wellness. Have you always been at this place? Were you interested in it or did it take something for you to open up to this? Mark Eiglarsh: Pain. And anyone listening to this, if you are going through pain, I think it’s a wonderful place to start. There has been no meaningful change at all in most people’s lives, and especially mine, until and unless I experienced enough pain where I said okay, now I am open to this flaky stuff, what’s this meditation stuff, and that began my journey. And I feel like if I keep it to myself, not only am I only as sick as my secrets; you keep things to yourself, but you are also not being of service to anybody. So the more I can speak about it and know that I do it without judgment or I don’t care what people think about me, it’s a wonderful thing. Christine Bilbrey: The audience today really responded to that. I have gone to other seminars where just as a warm up they want everyone to do a little bit of yoga and you look around the room and the attorneys are not doing it; they are all checking their phones, I didn’t see that today. I felt like people made themselves very vulnerable on stage. It was an amazing message. And I am curious Dori, you gathered — I feel like I am starting to know you from seventh grade, you gathered a lot of your friends together, you had Joe Ankus on the Committee and you have brought Mark to us, how did you go about putting the seven people together? Dori Foster-Morales: So this was just sort of happenstance. I mean the great thing about being a lawyer in Florida is it really is a big small town. The one thing I learned as I went on my travels this year was that so many people feel isolated and alone, and the irony is they could be in a room full of people and feel isolated and alone. And when I started to reach out to people and study and talk to people, people called me, I called them, there were connections made. I don’t remember even how Mark and I connected through another lawyer. And I knew him. Ironically, my dad was a dentist when I was a kid and his dad was a pharmacist and their offices or businesses were next door to each other in Miami Beach. But that wasn’t why I did it. I mean it wasn’t because oh, I knew Mark. I know tons of people. I have been in Florida almost my whole life. So it was really because his message was so powerful. Joe Ankus, he and I, we were in the same grade; Mark is a couple of years younger than me, he was in the same grade as me growing up, went to middle school and high school and law school with him. We weren’t really particularly good friends, we weren’t really friends at all, we knew one another, but again, he reached out to me. We have obviously created some professional relationship, but he reached out to me because he stopped practicing law, even though he was probably number one or number two in our law school class, and I certainly wasn’t there. And he stopped practicing because the anxiety became so overwhelming for him. So he was at a top-notch law firm and he literally couldn’t get out of bed in the morning and when I learned that story I thought that’s the kind of person we need on our Committee, somebody who can really empathize with what these folks are doing or feeling. And what we learn from Joe, or I call him Joey, what we learn from him is that maybe if the Florida Bar had been doing these things 28 years ago, he would still be practicing law, and that’s a driving force for him and I think it’s the driving force of lawyers that have lived through that that really can provide us with support, whether it was Mark, or Ron Ponzoli, who spoke from the heart about the changes he made in his life. When people hear that, I think it’s just an incredibly powerful message. When you hear from a Supreme Court Justice, Alan Lawson speak about his trials and tribulations. He is at the pinnacle of a legal career. He is a Supreme Court Justice and his struggles even after being appointed, if those aren’t powerful messages. And so that’s really how I brought the group together. I brought the group together by their messages. Mark Eiglarsh: We have got lawyers killing themselves. Dear friends of mine who look like they have it all and they are killing themselves. If they are not killing themselves, a majority are absolutely depressed, and if they are not depressed, they are just not as happy as they could or should be. I feel like it’s the time for us to get out there and deliver some really simple concepts, that you are as happy as you choose to feel and it’s the thoughts that dictate how you feel, and meditation helps by slowing down those thoughts. Being present and looking at what thoughts are coming to you and whether they are helping you or they are not and it’s a practice. Dori Foster-Morales: And Christine, you have worked with me on this initiative and I thank you for all of your hard work, I really couldn’t have done it without you. But there were other people that have equally powerful messages; some of them relied on religion. And it’s such a personal place where I learned people come from and people, people that we knew when we were young prosecutors, criminal defense lawyers who had bad judgment, became impaired by drugs and alcohol, who ended up in jail. I know one particular family lawyer, he spent 16 months in jail. He came out. He turned his life around. He became a member of the Florida Bar again. He is now on the Executive Committee of the Florida Bar Family Law Section. He is studying for his Board certification. He is on the Grievance Committee. This is the man who spent 16 months in jail. So I think the powerful message is people come from dark places and can turn them around, and that we really care. I think when people feel isolated and alone and don’t think we care, that’s the problem, and so that’s really what’s motivated me in talking to all of these people and bringing these groups together. Christine Bilbrey: And I think it’s important that the message is coming from the Bar, because the Bar was the big scary entity that was going to end your career if you ever opened up and said this out loud or anyone found out. And I know that when we started the Committee 10 months ago, Dori wanted some attorneys that would step up and say, I have been to therapy, I am taking medication, and she had a struggle finding somebody, who is going to be the first one to step forward. And until you get people in all different parts of the Bar, people that are looked up to, that are saying, here is my journey, here is what happened, I don’t think other people are going to get help until they see that it’s okay, and I love that that’s happening. I feel like even this little short period of time we haven’t — we have so far to go, but it’s amazing what you have already done with cracking this thing open and hearing people like you speak, Mark, it’s amazing. And I know that Dori said people would come up and like whisper in her ear, I am seeing a therapist, but they didn’t want to talk about that in public, but they wanted to tell her. Are you having that same experience as you talk about this, Mark, are people coming to you to say what did you do, how can I get help? Mark Eiglarsh: Yes, and so, I just said, I got to put it out there. The fear that I get, when my brain sends me the thought is, do I really want to open up and tell people about my experience of losing a child, halfway through a pregnancy or losing a dog, or the challenges, can I only had 15 minutes, but my victim story can go on for hours. Do I want to be doing that, and I wanted to avoid coming from a place of ego. It’s not, it’s coming from place of service. That’s why I’m here. There is no other reason is to be of service, and if I can help one person and I did get several come up to me and say, oh my God, something you said really resonated. Mark Eiglarsh: Then, how great does that make me feel? So, it’s selfish in some respects. I know service makes me feel good, but it’s selfless because I know I am helping others. Christine Bilbrey: And that’s the reaction that the speakers got. I saw the speakers come out and instead of feeling uncomfortable, people in the room were embracing them. I mean, I think it was powerful. We all got something out of being there. So, I thank you both. Dori, what are some things that we can look forward to that are going to come out? Dori Foster-Morales: That’s a good question. I mean more, more, more, the Special Committee has become a Standing Committee; the Special Committee of five has become a Standing Committee of 15. There were going to be a bunch of subcommittees created. We are going to roll out more CLEs, more specialized CLEs. Dori Foster-Morales: The Wellbeing Coaches. Christine Bilbrey: That was a sponsor of today’s CLE. Christine Bilbrey: So, you can have a virtual counselor, because I know, if you are in Miami and you don’t want to spend an hour in traffic and then you got to get back to work, if you can just close your office door and see a counselor in the privacy of your own law firm, that’s powerful, that’s very helpful. Dori Foster-Morales: So, those are the sorts of things we want to do. We want to give people options to get help. First, we want to — we are trying to blow open the doors and then once we blow open the doors to provide some assistance to those who want it, and I think just at a minimum knowing that they are not alone. So that’s really our goal. Mark Eiglarsh: I was very sincere when I put up my website, HYPERLINK “http://www.speaktomark.com” speaktomark.com, because I was genuinely hoping that there will be one person who just sends me an e-mail or just needs, hey Mark, could you tell me a little bit more about this? Those have happened. I have given it out before, and I have been able to help people, and it’s wonderful. Christine Bilbrey: And I saw a whole row. There was a row of law students in there. President Michael Higer was in the back. Christine Bilbrey: Former President Bill Schifino, like, it was such a cross-section of the profession. And I don’t know if you saw all these camera phones came up and they were taking pictures of the slide when you put up, your SpeakToMark on that. Mark Eiglarsh: Oh good, I hope they reach out to me. Christine Bilbrey: I think you are going to be hearing from them. Christine Bilbrey: And is that the best way — if people want to ask you more questions or get in touch with you, is that the best way? Mark Eiglarsh: I get all e-mails directly to my cell phone and I get all calls to my phone after hours, so I can be of service, yeah. Christine Bilbrey: And are you on any social media? Mark Eiglarsh: I am everywhere, and you can get there from HYPERLINK “http://www.speaktomark.com” speaktomark.com. Christine Bilbrey: Okay. Excellent. And Dori, if people want to find out more about the initiatives or just to reach out to you, how can they find you? Dori Foster-Morales: They can email me, HYPERLINK “mailto:[email protected]” [email protected]. Well, this has been another edition of The Florida Bar Podcast, brought to you by The Practice Resource Institute on Legal Talk Network. I want to thank our guests for joining us. If you liked what you heard today, please find and rate us in iTunes. I am Christine Bilbrey. Until next time, thank you for listening. Outro: Thanks for listening to The Florida Bar Podcast, brought to you by The Florida Bar’s Practice Resource Institute and produced by the broadcast professionals at Legal Talk Network. If you’d like more information about today’s show, please visit HYPERLINK “http://www.legaltalknetwork.com” legaltalknetwork.com. Subscribe via iTunes and RSS. Find The Florida Bar, The Florida Bar Practice Resource Institute and Legal Talk Network on Twitter, Facebook and LinkedIn, or download the free app from Legal Talk Network in Google Play and iTunes. The views expressed by the participants of this program are their own and do not represent the views of, nor are they endorsed by Legal Talk Network, its officers, directors, employees, agents, representatives, shareholders, and subsidiaries. None of the content should be considered legal advice. As always, consult a lawyer.